Number of rows 20 pcs. 24 pcs. 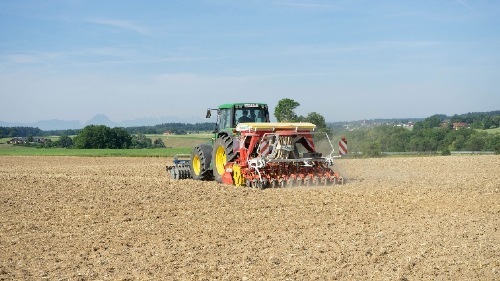 In the field the weight of the seed drill acts directly on the rear roller. The power harrow retains its freedom of movement and can ride over stones. 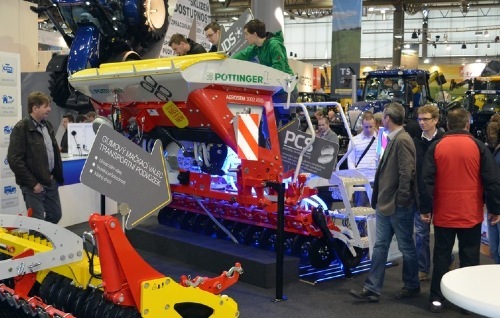 Mounted on power harrows or compact combinations, the weight of the seed drill acts right at the front end. 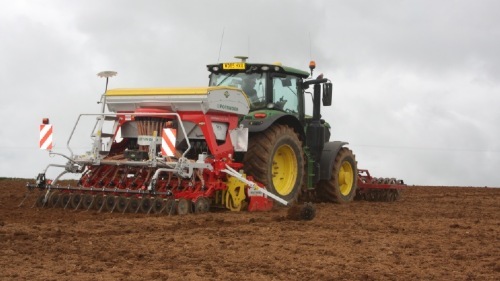 The additional weight of the seed drill on the rear roller provides even better consolidation for the seedbed. The gap between the coulters and the power harrow rear roller is minimised to form a compact unit. Coulter pressure up to 25 kg. VITASEM A CLASSIC models have a smaller seed hopper. They are consequently lighter and designed for operation with smaller 4-cylinder tractors. Very good visibility to the rear is possible thanks to the lower seed hopper. The large DUAL DISC coulters allow high working speeds when mulch drilling and operating in heavy, hard soils. Coulter disc diameter 350 mm. Coulter pressure up to 50 kg. 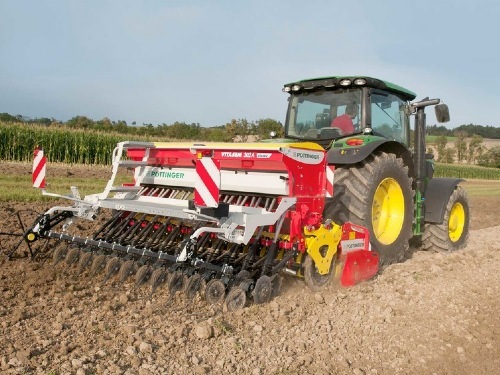 VITASEM A drills are quickly and easily fitted to the harrow. Drive under the seed drill and lift the power harrow. Fit retention bars to secure seed drill. 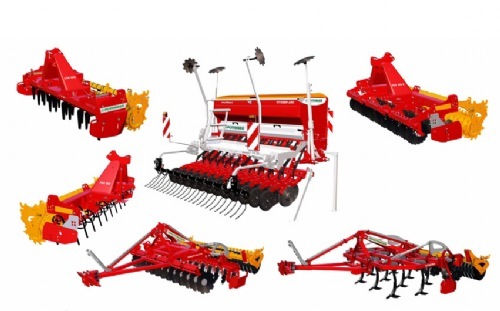 Fit top link to seed drill. 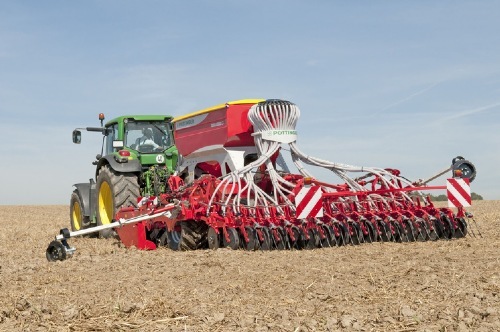 The implement-mounted drill is fixed to the rear roller and guided via the top link that forms a parallel linkage. 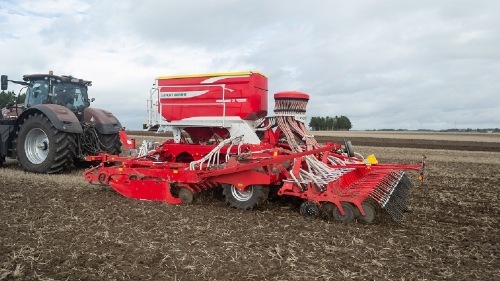 Packer and seed drill form a single unit. This enables the working depth of the power harrow to be changed by adjusting the roller without having to correct the seed drill top link. 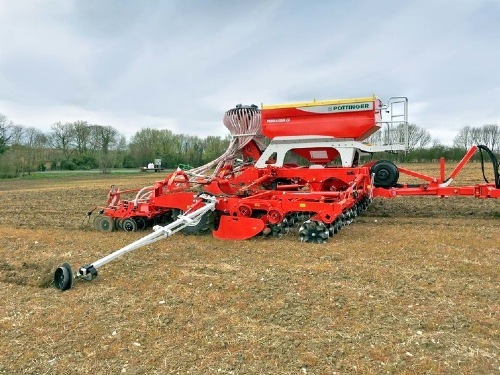 A hydraulic cylinder is also available to pivot the seed drill up over the power harrow. Best position of centre of gravity in relation to tractor. 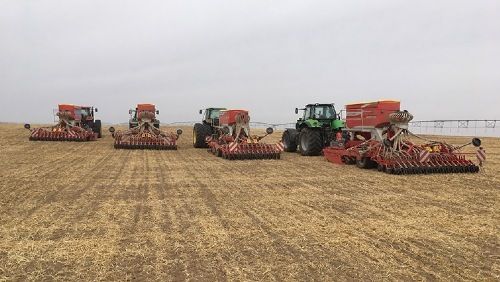 The high ground clearance of the drill coulters means that the power harrow can be used on its own - for levelling of plough furrows, for example. The headstock is integrated into the seed hopper - centre wall and bulkhead plate for highest possible strength. A partition plate inside the hopper prevents the seed from wandering to one side when working across slopes. A seed level indicator is fitted as standard. LED Lighting for seed hopper is optional. Two angles of opening with limit stop (85° or 103° for Big-Bags). The design of the seed hopper cover is unique in the farming business and has been adopted from the car industry. Instead of being welded, the cover plate is bonded to its frame so that no weld seams are visible. The front and rear wall of the VITASEM seed hopper is so steep that all the seed flows to the metering system without the need for an agitator. Rotating agitator shaft optional for the seed types which tend to bridge. The oscillating agitator is very effective for seed material that is liable to segregate or does not flow well, such as grass seed. Can be switched on and off manually in a single move. The seed is drawn straight from underneath the feed funnel. This system ensures uniform seed flow, even when working up and down slopes. Wide, funnel-shaped outlets above each metering wheel ensure precision feed right down to the last grain, guaranteeing minimum residues and low minimum filling quantities. The wide opening angle of the bottom flap ensures that the metering area is completely emptied. Side access on the left with folding step and handrail along seed hopper. Optional right-hand bridging step available for VITASEM A. The secure handrail is mounted directly on the seed hopper (not on the cover) for enhanced safety. Easy to fill thanks to plenty of space for seed sacks, the handrail on the seed hopper and the large hopper opening. 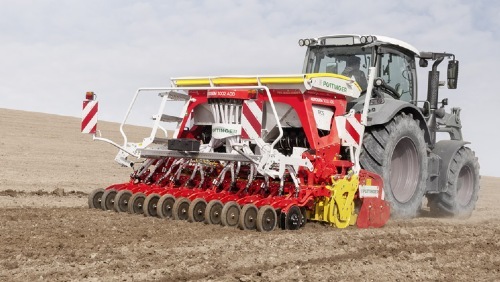 Their unique seed metering system is the trademark of VITASEM seed drills. Two completely independent metering units are combined in the one seed housing. The metering wheels are located on the same metering shaft. The advantage is that the small seed and normal metering wheels no longer need to be individually locked. Central adjustment of seed flaps. The spring-loaded, individually adjustable flaps can easily ride over foreign objects. The partition integrated into the seed flap prevents overflowing. The raised partition prevents grain overflow when changing from fine to normal metering, guaranteeing precision seed flow. The metering wheels are suitable for all kinds of standard seed types. 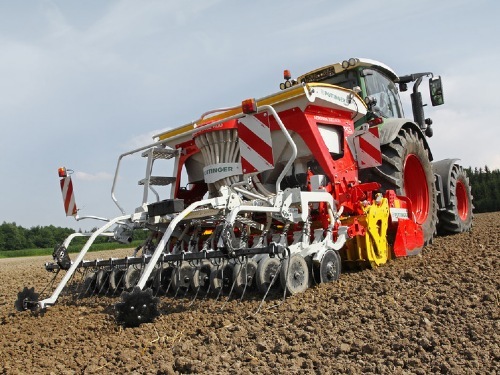 The multi-sow system handles any seed with perfect metering accuracy - from 0.7 kg to 400 kg/ha. Two individual metering wheels in each housing mean you can switch between normal seed and small seed metering within minutes. 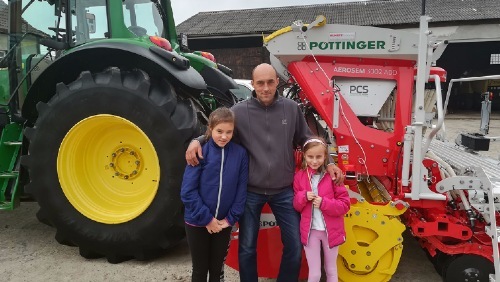 The benefit of this innovative solution lies in the considerable improvement to seed output accuracy with small seeds and the ease in changing between seed sizes. The main priorities of seed drill technology - reduction in wastage and optimised plant distribution density - have been well catered for. A separate inlet slide for the small seed and normal seed range make it easy to switch between small seed and normal seed metering by pushing in or pulling out the slides. The system guarantees you can switch the metering in seconds. The optimised shape of the metering peg ensures the highest level of seed protection. 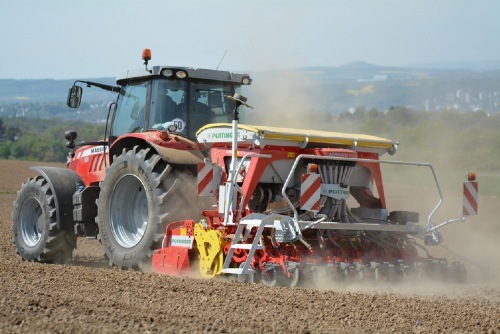 Drilling rapeseed with low numbers of seed per square meter for optimum plant distribution density is ensured by the unique small seed metering wheel with its sawtooth shaped profile. Precision sowing principle for poppy seed and clover, etc. 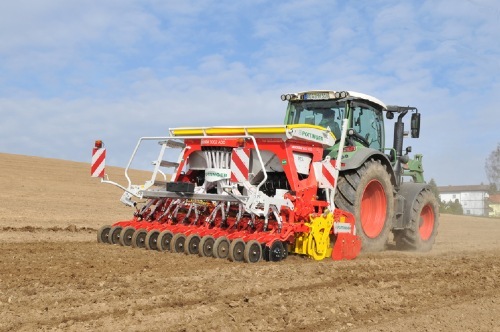 Unique on mechanical seed drills. To plant small seeds, the direction of rotation of the metering shaft is changed by simply switching the gears in the side drive unit. Small hollows on the rear of the sowing wheel pegs take only one grain and drop it overhead into the seed funnel. Extremely low seed density below 1 kg/ha. Yield at harvest is influenced by precision seed placement. Regardless of whether you have light, heavy, dry or moist soil - optimum placement of the seed is critical for a satisfactory harvest. for the same pressure on front and rear coulters. Coulter arms are secured using large clamp mounting on the coulter rails. Wide coulter arm mountings with replaceable bushes. Ability to ride over foreign bodies with up to 18 cm (7.09 inches) movement upwards. Coulter increments (positioning) of 30 cm (11.81 inches) ensures that large amounts of seed can pass through without blocking. 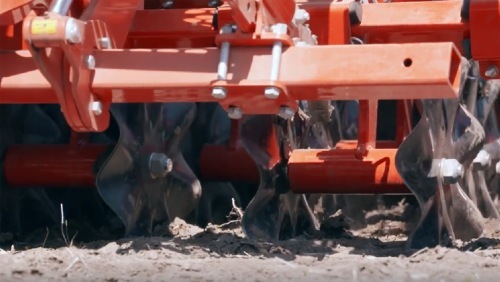 Seed depth is controlled via the coulter pressure even without press wheels. The scalloped disc coulters are suitable for mulch drilling and when there is a lot of organic matter. 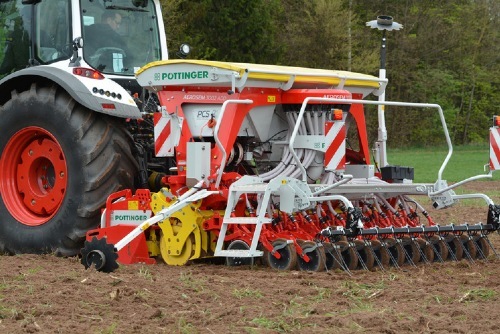 PÖTTINGERs diagonally tracking disc coulters open up the soil. The cast shoe, similar to a Suffolk coulter, removes wilted straw and crop residues from the seed placement area and forms a neat seed slot. This process guarantees even seed germination. Different shapes of coulter with an inter coulter rail spacing (coulter offset) of 30 cm provide sufficient clearance even when operating in harvest trash. Dished single-disc coulters, diameter 320 mm, with twin-race tapered bearings fitted with special seals. The rotating scrapers are adjustable and located to the rear so as to not reduce side clearance. Easily handles large clods. The disc coulter is fitted with a long life hard wearing cast coulter point. 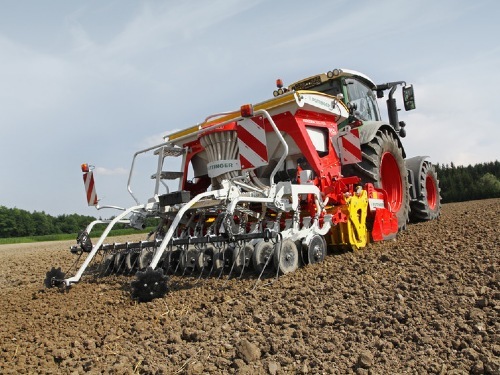 The Suffolk coulter is suitable for soil conditions where there are low amounts of organic matter. A protective flap closes each coulter automatically if the machine moves backwards. The spring-mounted coulter can fold back for reliable protection. Depth guidance rollers 250 x 40 mm available as option to limit depth and provide consolidation Straightforward pin-in-hole depth adjustment. Can be fitted and removed using hooks - no tools needed. Uneven placement depth even in changeable soil. Presses down to cover seed perfectly. Reliable germination even in dry conditions. Large dimensioned inlet funnel for transition to seed tube (especially for spelt). The creases in the inlet funnels provide maximum flexibility of the seed tubes to ensure perfect transport between the metering wheel and the coulter. The telescopic seed tubes are stainless steel at the top and synthetic at the bottom to provide the lowest friction. This combination of materials greatly reduces the static charge in the seed grains. The large DUAL DISC coulters cut right through surface trash to form a uniform, tidy seed slot. Harvest residues are not pressed into the ground. In combination with the coulter element on the inside, this system achieves a uniform, tidy seed slot. 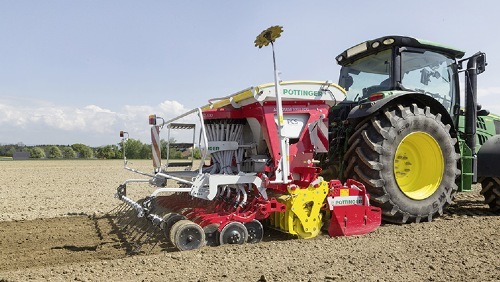 World-class technology for future-safe arable farming. Disc coulter diameter 350 mm, up to 50 kg coulter pressure. Row spacing 12.5 cm for best plant distribution density. 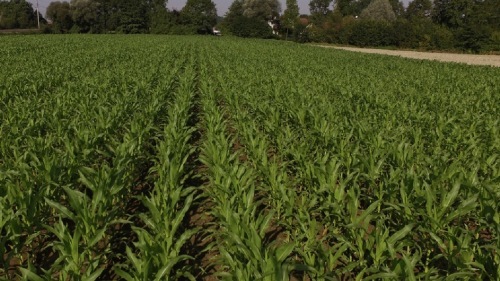 Row spacing 15 cm for difficult soil conditions. Aluminium coulter arm to reduce weight. Same length arms - constant coulter pressure system. Each of the disc coulters is guided by a press wheel to ensure uniform seed placement depth – press wheel diameter 330 mm. Inter coulter rail spacing of 300 mm provides large clearance and smooth material flow even with large amounts of organic matter. A well-formed, tidy seed slot is essential for successful drilling. The guarantee for optimum placement and uniform germination. The seed grains are placed at defined intervals, covered with a layer of fine soil and pushed down by press wheels. The depth can be quickly adjusted using a ratchet lever on either side at the front of the seed drill. The orientation scale guarantees uniform seed placement depth. The 10 mm harrow tines feature spiral springs for perfect ground tracking. Shocks are absorbed using maintenance-free rubber mountings. Damage is prevented if reversed inadvertently. Easy to use adjustment functions for depth and pressure. Outer tines can be retracted for road transport (3.0 and 4.0 m transport width). Ridging is prevented by a pair of harrow tines at either end. Designed for intensive levelling effect. Offset angle tines sweep the whole surface level. 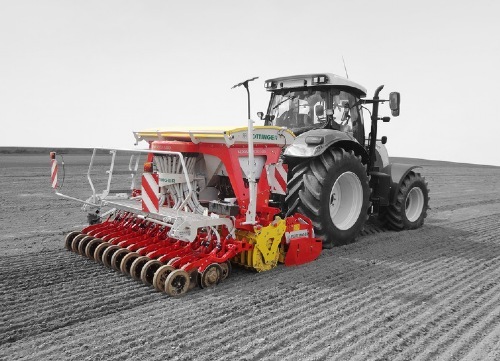 On VITASEM A seed drills the land wheel is positioned within the working width - no need to remove the wheel for road transport. The large diameter wheel has a large area of contact with the ground to minimise slippage. Hydraulic lift system is also available. The step-less gear mechanism is submerged in high viscosity oil for smooth, uniform seed flow, even at low speed. Quick, accurate adjustment by shifting the gear lever on the finely-calibrated scale on the side of the machine. Electric metering is available as an option in connection with a POWER CONTROL or CCI ISOBUS control terminal. The speed signal is provided by a DGPS sensor or by the tractor radar sensor. The seed flow rate can easily be adjusted from the tractor seat. Calibration at the press of a button. All adjustments can be made from the left-hand side or back of the machine. Everything in one place saves time. The adjustment controls are easily accessible and positioned ergonomically. Coulter pressure is adjusted centrally on the left hand side of the machine (using an orientation scale). Precise tension spring matching ensures the same pressure is applied to the front and rear coulters. Hydraulic coulter pressure adjustment is also available. Central coulter pressure adjustment on the VITASEM ADD up to a pressure of 50 kg. 400 mm diameter for clearly visible centreline. Hydraulically operated with switchover valve, mechanical interlock. 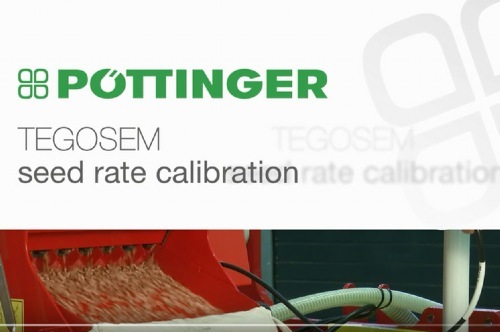 Whether calibrating, working in the field or emptying the seed tank – each step has been optimised. Calibration system with integrated freewheel for stationary calibration. Calibration system with output adjustment. Access ladder and land wheel are laid out intuitively on the left-hand side of the machine. With the electric seed rate system, you can change the output from the tractor seat without stopping. COMPASS, the optional electronic control unit, makes it easier to operate the machine and guarantees consistent monitoring. Modern, multiple-line graphic display with raised, back-lit keypad. Automatic tramline switching with tramline stop. Job and total hectare counter. Available as option: additional metering shaft and level indicator plus electrical seed flow-rate adjustment. Optional POWER CONTROL terminal for VITASEM A and VITASEM ADD with electric metering drive. Optional CCI ISOBUS terminal – this terminal lets you operate all ISOBUS-compatible machines, regardless of brand. SEED COMPLETE is then also possible. Enter quantity and current gear setting. Calibrate for 1/10, 1/20, 1/40 or 1/100 ha. The rotations are counted and a signal sounds for the last five. Enter calibrated amount – new gear setting is calculated. 10 languages, 100 m compensation, sensor test. Tramlines are controlled using the COMPASS control unit. An electric motor shuts off the relevant metering wheels. Up to five metering wheels can be switched off per track. You only need to enter the spraying width and the tramline rhythm will be calculated automatically. Asymmetric tramlines and custom tramline configurations are also possible. Different track widths are possible on one machine. Ideal for shared machinery and contract work. Switching via land wheel sensor, transmission signal or track marker change-over valve. Tractor hitch signal or sensor wheel.